Advances in Botanical Research publishes in-depth and up-to-date reviews on a wide range of topics in plant sciences. The series features several reviews by recognized experts on all aspects of plant genetics, biochemistry, cell biology, molecular biology, physiology, and ecology. 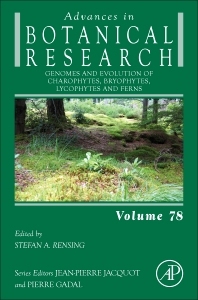 Volume 78 focuses on the Genomes and Evolution of Charophytes, Bryophytes, Lycophytes, and Ferns. Sequencing of genomes of ‘lower’ animals such as sponges or hydrozoans has much informed our understanding of how metazoans evolved. On the plant side of things, sequencing and comparison of a moss and lycophyte genome with those of green algae and flowering plants has greatly informed our understanding of plant evolution. However, it has also become clear that we need to look into genomes of the closest algal relatives to land plants, the charophytes, and into further genomes of bryophytes, lycophytes, and ferns to unravel how land plants evolved. Prof. Dr. Stefan Rensing works at the Department of Cell Biology, University of Marburg, and the Institute of Biology II, University of Freiburg.